Times : Arrivals Friday eve 4pm onward, Saturday & Sunday 9am – 5pm. Fee : Full rate , includes all meals - £160 to £200 (Sliding scale - pay what you can afford according to your income). Concessionary rate is available for those with no income £140 (limited to 3 places).. Contact : Merav, 01694 -751374; Email: [email protected], Karuna Insight Design on Facebook. Booking: please complete the booking form at the bottom of this page. 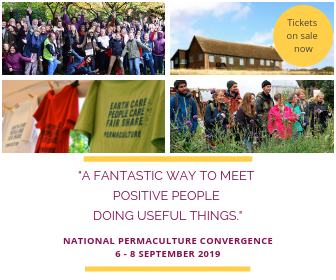 Course tutor Tomas Remiarz is the author of “Forest Gardening in Practice” and has over 20 years experience in permaculture design and practice across the UK and various European countries. Over the years, he has been active in many different fields, with an involvement on the restoration of land, buildings and communities. Tomas is currently part of a group developing a 6-acre co-housing site with 3 buildings in Herefordshire.